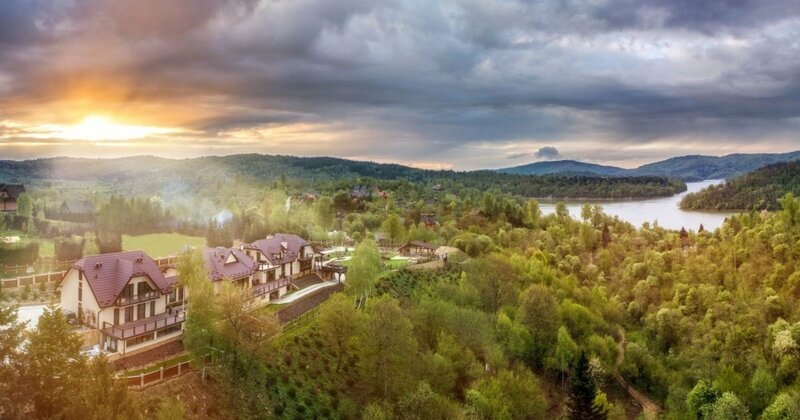 Villa Collis is a luxurious and very intimate resort located on a 5-hectare parcel at the top of a Solina Lake peninsula and at the foot of Otryt, a wild mountain range, at the heart of Bieszczady. Villa Collis offers scenic location. Situated at the top of a penninsula at the heart of Bieszczady, it is surrounded by Lake Solina on the one hand whilst on the other it neighbours Otryt, the wildest mountain range of the Bieszczady Mountains. It is the place to find peace and admire the beauty of Bieszczady nature any time of year. A beautiful view of the lake, the forests and mountains, direct access to the lake and to the small Bieszczady ring road, neighbourhood of many hiking and biking trails as well as the upper San valley, calm, quiet and beautiful nature all make the place truly special. Most rooms offer terraces or balconies overlooking the lake and forests and allow observation of wild animals. Neighbouring the facility, and distant from regular tourist trails and roads, there are many kilometres of off-road, bike and jogging routes ensuring peace and calm. The facility offers a restaurant available to Villa Collis guests exclusively where one can find full board (light and healthy breakfast made from ecological products as well as lunches and dinners). There is also a free parking lot and 24/7 security. It’s a sin to stay here only for 3 days!!!! If I were to go back to Bieszczady, I'm sure it would be there !!! Astonishing tranquillity! Relaxation! Calmness! Comfort!